Go here for more about Obama's Second Inaugural Address. Go here for Obama's First Inaugural Address. 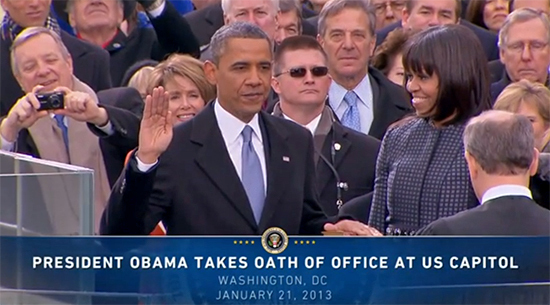 Here is the video clip of Barack Obama's Second Inaugural Address. Scroll down for the transcript. It follows the full text transcript of Barack Obama's Second Inaugural Address, delivered at the West Front of the U.S. Capitol at Washington D.C. - January 21, 2013. For we remember the lessons of our past, when twilight years were spent in poverty and parents of a child with a disability had nowhere to turn. We do not believe, in this country, freedom is reserved for the lucky or happiness for the few. We recognize that no matter how responsibly we live our lives, any one of us, at any time, may face a job loss or a sudden illness or a home swept away in a terrible storm. The commitments we make to each other, through Medicare and Medicaid and Social Security, these things do not sap our Nation; they strengthen us. They do not make us a nation of takers; they free us to take the risks that make this country great. We, the people, declare today that the most evident of truths, that all of us are created equal, is the star that guides us still, just as it guided our forebears through Seneca Falls and Selma and Stonewall, just as it guided all those men and women, sung and unsung, who left footprints along this great Mall to hear a preacher say we cannot walk alone, to hear a "King"' proclaim that our individual freedom is inextricably bound to the freedom of every soul on Earth.